Foster and Déchery’s sprint through history. The publicity suggests a frantic 70-minute scramble through the big history of the 20th century with all the major landmarks – world wars, assassinations, space missions, Cold War escapades – intact. Visiting Bristol as part of Mayfest, Foster & Déchery’s Epic, however, proves to be a more complex and intellectually engaged interrogation of the nature of history itself, the ‘epic’ of its title having more to do with the Brechtian style of the piece than with the scope of the content – although tangential connections to the 20th century’s world wars, assassinations and so forth do appear. The central conceit, in short, is that each of the four performers (two English, one French, one Portuguese) looks back at the events of the 20th century via the reminiscences of family members, introducing and commenting on video’d interviews they’ve recorded with parents and grandparents (or not, in the case of Pedro Inès, who admits to having come to the project late). These ancestors recall stories which touch on major historical events, but wars, upheaval and politics really only form the background to the detail of their own experiences. A World War Two tank driver misses the liberation of Paris; an inspector of coal mines has a run-in with Arthur Scargill but not during the pivotal events of the 1980s Miners’ Strike: a father remembers the 1968 uprising in France but chiefly as an excuse to bunk off lectures. At the same time, the piece also foregrounds the apparently trivial and incidental: a soldier caught up in a colonial war performs a small but not insignificant act of defiance, and the sinking of a ship nobody remembers becomes the defining memory of a Merchant Navy veteran. Around these fragmentary, often affecting reminiscences, the cast draw on a broad palette of styles and techniques to flesh out anecdotes, develop their themes and fill in, as it were, the historical background. Relaxed storytelling and multimedia ‘conversations’ with the pre-recorded interviewees segue into tightly choreographed dance, music, song and sequences of stylised, symbolic movement which re-enact – or perhaps more accurately – invoke the major historical events the video’d relatives seem to have always just missed, from the assassination of Archduke Franz Ferdinand in Sarajevo and the First World War to the swinging 60s, the Moon landing and the end of Salazar’s dictatorship in Portugal. There’s humour in this, too, with Buzz Aldrin bemoaning Neil Armstrong’s upstaging of him when the Eagle finally lands on the lunar surface, a conversation about family history turning absurdly competitive, and Bertolt Brecht himself putting in an appearance to instruct the performers in how to adopt the unemotional detachment required for his ‘epic’ approach to theatre. Perhaps paradoxically, given these nods to Brecht and his alienation techniques (projected scene descriptions, deadpan delivery etc), one of the real strengths of Epic is its intimacy and candour. 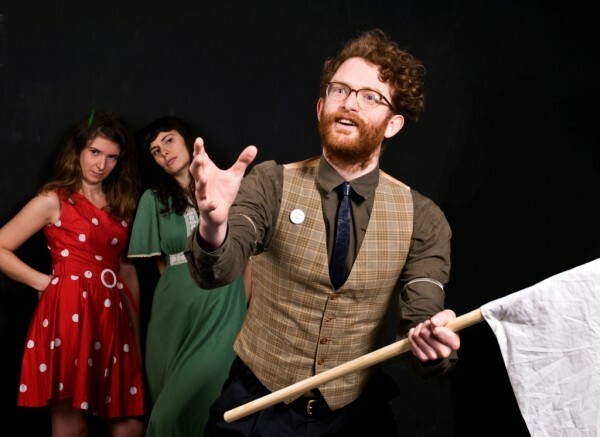 All four performers are disarmingly open, talking about their family histories without becoming either reverential or patronising, and acknowledging their own failings when it comes to valuing the disappearing stories of preceding generations. Evolving a theatrical ‘language’ which succeeds in both embracing these moments of familial revelation and delving into the connections between personal memory and public history, Epic makes for an intriguing exploration, not only of the 20th century, but also of dramatic representation itself.